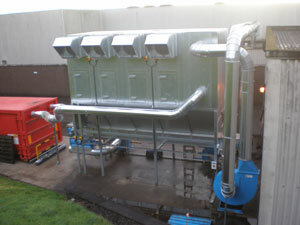 Dust Control Solutions Ltd design manufacture and install all types of fume extraction systems for industry all over Scotland. All of our fume extraction systems comply with current regulations with regard to handling hazardous fumes. Handling dangerous explosive gases, for example extraction from spirit stores in a distillery is also a process Dust Control Solutions Ltd can manage. We also provide services in paint fumes dry back extraction systems. Welding fume extraction is also in our remit, with all of our filters incorporating reverse jet filter cleaning. Our design is to suit our clients specific requirements and needs ensuring our design complies with current health and safety, environmental and COSHH regulations covering all aspects of industry. We specialise in the heavy engineering industry as well as all aspects of manufacturing whether clients are handling steel, aluminium, titanium, wood, food and animal feed materials. When we are contacted by a potential client we will have an experienced design engineer visit, discuss the project and survey the actual requirements to enable us to present a project design, we as a company do not provide solutions from a standard catalogue and product range, all enquiries are designed to sit specific needs. We as a company have a simple mission statement, to provide all of our present and potential clients, KNOWLEDGE-EXPERIENCE-SOLUTION. We provide services throughout the UK including Scotland, England, Wales, Ireland, Glasgow, Edinburgh, Aberdeen, Inverness, Carlisle ,Stirling ,Newcastle ,Dundee, Belfast and East Kilbride.